At the AGM 2015 we were delighted to award the first Phil Gusack Essay prize with his sister, Pauline Gusack, proudly representing him in the audience. We think he would have approved. Four finalists were chosen and their essays are published in full here. Cecilia Gunning by the judges’ unanimous decision, was awarded this first essay prize, and in the time honoured traditions of such awards ceremonies, John Cooper had recorded a short interview with her via skype which was shown at the meeting. The prize trophy and cheque for £500 per awarded to Cecilia for her essay entitled Healthcare off the grid: what we can learn from food truck markets. Her essay will also be published in the RIBAJ. The single patient room is not the only option by Ryan Hullinger, Carl Yost and Brian Zeallear. 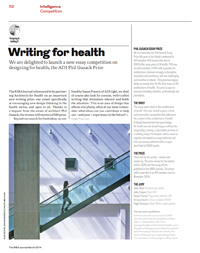 Architects for Health are launching the Phil Gusack Essay Prize this year as his family’s memorial to AFH member Phil Gusack who died in 2011 after some years of ill health. Phil was an active member of AfH with a passion for architecture who believed strongly in disruptive innovation and excellence and was challenging and inventive in debate. This generous legacy funds an annual prize for the best essay on the architecture of health. The prize is open to all people including students, professionals and journalists. The essay must relate to the architecture of health. The topic should explore a fresh and provocative perspective that addresses the context of the architecture of health. It should demonstrate how good design for health can and should happen without the essay being a survey, a descriptive process or a building study. Participants will be asked to register and submit an essay which has not been previously published with an upper word limit of 2000 words. There will be two prizes – winner and runner up. The prize money for the winner will be £500 and this essay will be published in the RIBA Journal. The prizes will be awarded at an AfH Member event in November 2014. Entries should not exceed 2,000 words and must be emailed to essayprize@architectsforhealth.com no later than 1 September 2014. People of all ages are invited to submit and the essays should be wholly the work of the person submitting them. The decision of the judges will be final.